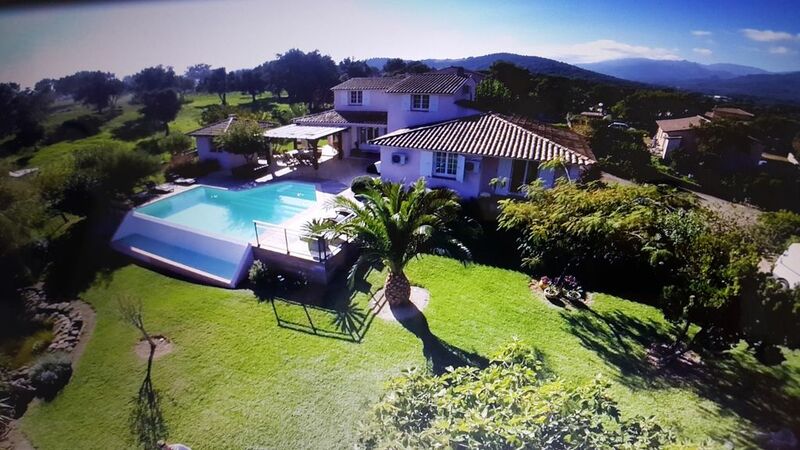 Nice villa with heated infinity pool, well located, comfortable, Spacious, tastefully decorated, air conditioned. The living room and the kitchen give on a beautiful terrace of more than (80m ²) extended by the swimming pool, true place of life, equipped with a living room, a corner meal, a barbecue, summer kitchen equipped. Garden 1500 m2 raised and shaded decorated with a pond with fish. The Cavu River with its natural pools. and his Snack. Linen and cleaning included. Rental agreement. DEPOSIT 1500 €: The deposit will be refunded the week following the end of the stay (Posted on Monday) minus the deteriorations if occasioned. We spent a fantastic week at this beautiful villa. It’s very spacious and has everything you need. The pool area and gardens really make it though! The infinity pool looks out across uninterupted views to the mountains and a glimpse of the sea beyond. Stunning. We have young kids and they didn’t want to leave the villa! Very close to some fantastic beaches. All in all a great find. Philippe the owner is very friendly, responsive and accommodating. Skønt hus, med plads til den store familie. Vi nød udeområdet , udsigten og poolen. Nous avons loué cette maison entre amis et nous avons passé un excellent séjour. La disposition de celle ci est très agréable. Wir waren 6 Erwachsene und 5 Kinder im Alter zwischen 1-10 Jahren. Das Haus ist geräumig und bietet ausreichend Platz. Bestechend schön ist der traumhaft angelegte Infinity Pool mit Blick in die Berge, eingebettet in einen idyllischen, sehr gepflegten Garten. Der Grillplatz mit einer Aussenküche und einem großen Essbereich lädt zu gemütlichen Abenden mit Blick auf die Sterne ein. Wir haben den Aufenthalt sehr genossen und können das Ferienhaus mit voller Überzeugung empfehlen. Die Lage ist durch die Nähe zu wunderbaren Stränden (10 min mit dem Auto) und durch die gute Anbindung zu Einkaufsmöglichkeiten oder der Hauptstraße Richtung Bonifacio (der mittelalterlichen Festungsstadt im Süden) toll gelegen. Wir werden immer an den schönen Urlaub zurück denken. La piscine a fait le bonheur des enfants . PS On a apprécié le service linge de maison +ménage et les lits faits à notre arrivée ! Nos tarifs comprennent l'ensemble des charges : ménage de sortie, draps, linge de toilette et de cuisine, l'entretien de la piscine ainsi que la taxe de séjour. Versement des arrhes d'un montant de 25% du montant de la location à la réservation. LE SOLDE est à RÉGLER avec la CAUTION de 1 500 € à la remise des clés. LA CAUTION ne sera pas encaissée et restituée le jour du départ sauf si l'état des lieux justifie une retenue TARIF dégressif pour 15 jours de location. (- 200€ sur le TOTAL) Contrat de location envoyé par mail si réservation.